Watch some music videos below. Just vocal, banjo, upright bass and a bit of harmonica on this album. Recorded in Fast Heart Mart's apartment on August 7th 2017. Half covers and half original songs. 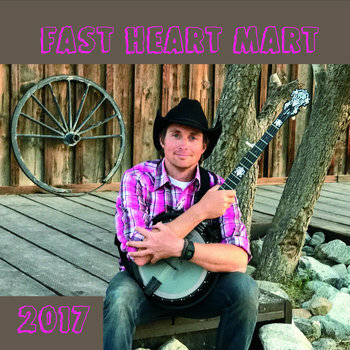 Fast Heart Mart is playing a lot of farmers' markets and city sidewalks these days, so he's had to adjust his repertoire accordingly. It is rare for FHM to do a cover song, but in this day and age it is what people want to hear. When a musician plays on the street, they only have about 10 seconds to catch a passerby's attention. Sometimes the best way to do this is to play something familiar, like a well done cover song. Not to worry though, FHM covers songs in his own way, giving them new life. I mean have you ever heard "Crazy Train" done with a banjo before? Die hard FHM fans will be glad to know that there is 2 new original songs on this new album as well as 5 older original tunes that have been rerecorded to represent their current incarnation.